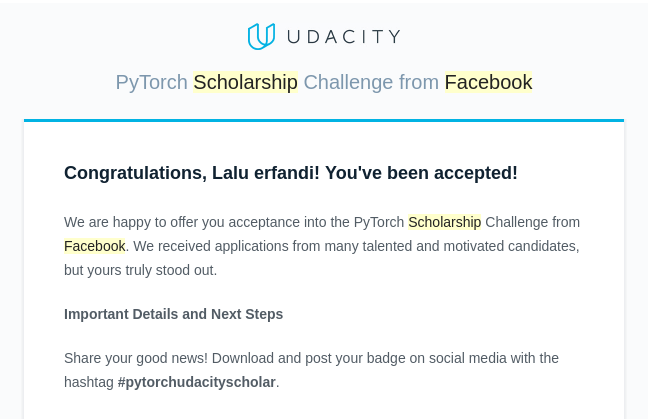 My study journey started on 8 October 2018, Udacity sent an email to me, to tell about their new program for the scholarship sponsored by facebook artificial intelligence. 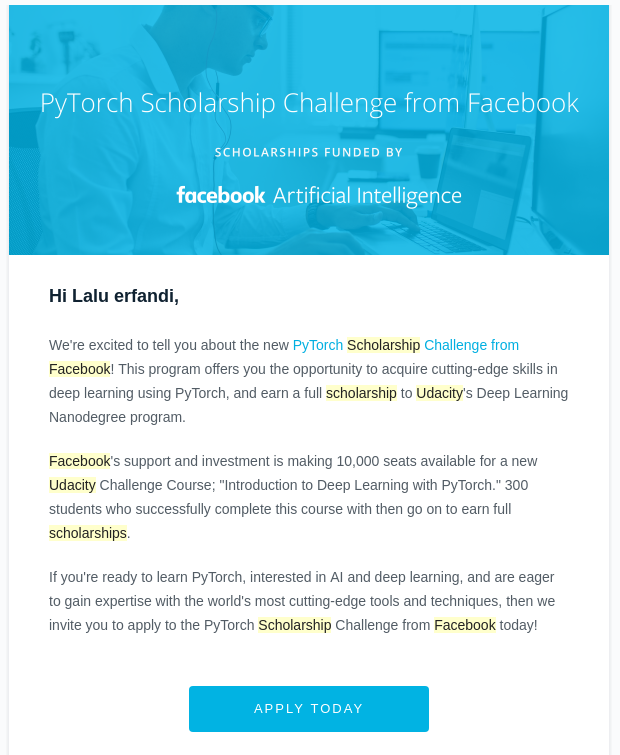 The email invites to apply PyTorch Scholarship Challenge from Facebook. A: What do you want the world to know about you! B: Why did you apply for this Scholarship? C: How will you use the knowledge you gain from this program? I fill the answer in the form that has been provided and waits for approval from udacity scholarship. After waiting about 21 days I got an email from udacity that tell me I’ve been accepted for udacity scholarship. I’m very happy that I’m selected to be a scholarship among 10.000 people around the world. For me phase 1 is an unforgetful moment, 10.000 people around the world gathering together to thrive together for solving the final project. At that moment I got so many friends from all around the world. We make an online meeting via google hangout and many other platforms to discuss together our strategy and to learn pytorch in order to solve the final project. Very lovely experience, heart warmer moment for me, all people around the world help each other to solve the final project. I wonder in my mind, why we did not use this way to solve our environmental problem and other issues that hit us as human nowadays, but that’s only my humble opinion. Racing together in a very positive environment like that make me feel highly motivated toward finishing the final project and share and help another member to achieve the same result. That moment, I was felt that I will not accept to the next phase, I felt that because I think there are so many people that can finish the final project and they are good at it. With this kind of mindset, I decided to do my best to help the community to solve their problem until I got the deadline from my company to make the product (web service) for deep learning project that still ongoing to build. At that moment, I felt that I can’t get to the next phase until I saw people got an email whenever they pass or not pass. I think that I would not pass, but I want to see what udacity tell me about so I check my email inbox. What I was found is a very unexpected email that informs me about I was accepted to be the 300 people who pass to the next phase. I can’t say how happy I’m that day with word or sentence, it hard to describe but very easy to feel. 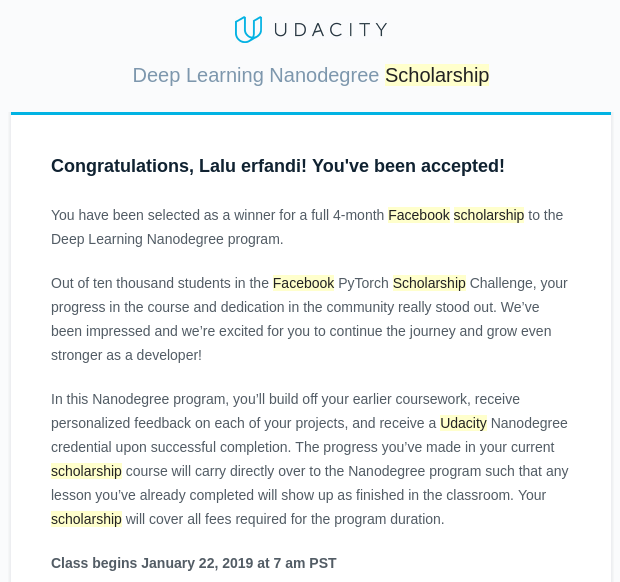 After I got selected to phase 2 in the study program Deep Learning Nano Degree at udacity, the hardest part of the scholarship begins. There are 7 projects to solve, five of them are code challenge, two of them are professional Github profile and professional LinkedIn profile. I got a problem with LSTM sentiment analysis project and GAN project. That two projects need 1 to 2 weeks to solve, but that project expands my skill deeper about deep learning. Alhamdulillah, All praise due to Allah, Lord of the worlds that help me finish my scholarship in Deep Learning Nano Degree. 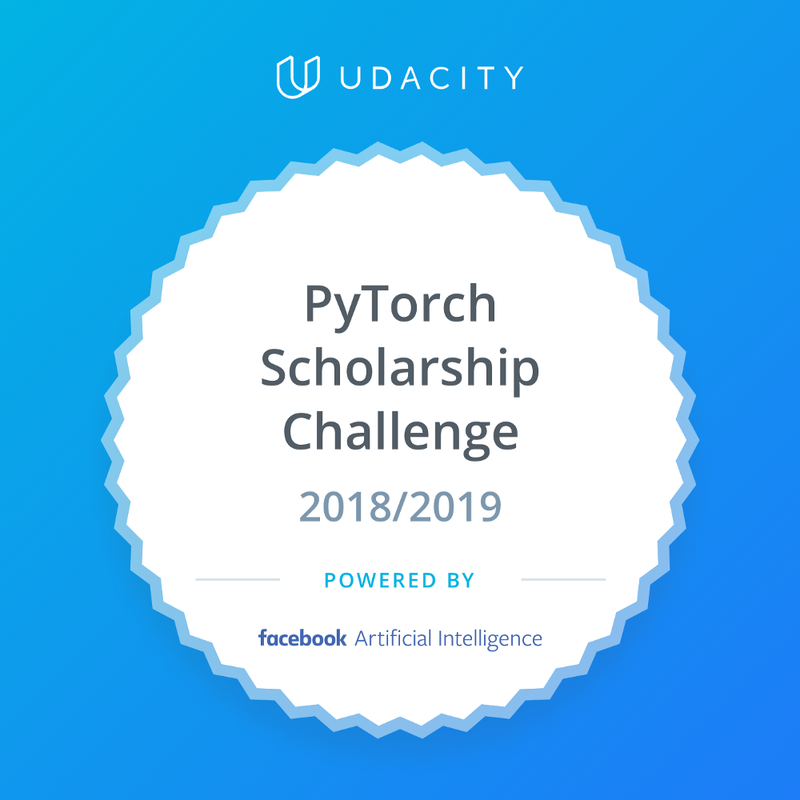 Filtered from 10.000 people around the world in phase 1 and then again filtered to 300 people for phase 2 to get Scholarship from Facebook Artificial Intelligence and Udacity in their scholarship program PyTorch Deep Learning Nano Degree. Its long journey for me, with its tough project to solve, but Alhamdulillah I can finish it. Thank you Facebook and Udacity for your scholarship, your material helps me a lot in my job as a Machine Learning Engineer to solve the problem of artificial intelligence in the real world. Previous Post:How to learn machine learning for free? Next Post:My Neural Network Bracket Loved Auburn All The Way to the Final Four!